Enter the raffle to win a free lunch at the Pyramid Club! Tours of the club will be given to anyone interested in a membership. First Thursdays are fun and interesting monthly cocktail receptions where you can meet international business professionals, Sister City and State Department guests, foreign exchange students and new friends who share your love for travel. Each month, you visit a different center city restaurant, private club or hotel to experience the best of the international community in Philadelphia. 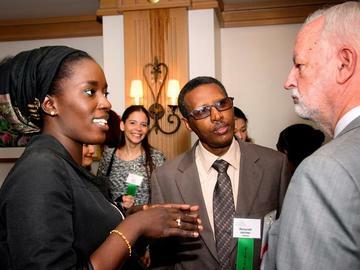 You can practice language skills, make professional connections, and learn first-hand about what's happening internationally. To add to the fun, you can enter our card drop drawing to win treats, tickets, tours or dinner from our favorite Philly spots. Drinks will be served at the cash bar. Space limited! On-line registration closes as soon as we hit capacity or latest May 2nd at 11am. Admittance to this location is limited to age 21 and above.